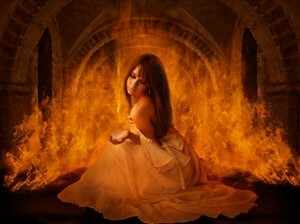 The fire sparkles and gentle warm gusts make her gown swirl around her. She is not burned or bothered by the flames. Notice the background detail with the bricks and archways you would find in centuries old ruins. Did she magically appear from another time?